Rovers were without leading scorer John Marquis and centre back Tom Anderson for the visit of the Pilgirms. Ben Whiteman, Ian Lawlor and Joe Wright also remain sidelined. 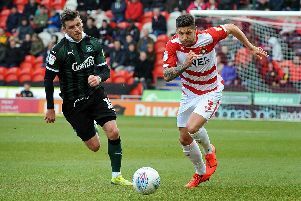 But first half goals from Tommy Rowe and Danny Andrew secured a fourth successive win and kept sixth-placed Rovers on course for the League One play-offs. Herbie Kane made an impressive and welcome return in midfield, Paul Downing shone in the absence of Anderson, while Mallik Wilks moved inside to cover for Marquis and performed admirably. “The biggest pleasing thing is the fact that we’re losing all these players – we keep getting little niggles and knocks – but people are coming in and stepping up to the plate,” said McCann. “Whoever it may be, they’re coming in and producing a very good performance and putting themselves in the picture to be playing week in week out. “We know we’re in a good place. “We’ve got Whiteman and Marquis to return very soon. “We’ve got Joe Wright back on the grass, doing running. He’s probably two or three weeks away from full training. “Ian Lawlor’s back out on the grass as well doing some handling. “We’ve got some big players coming back and we need that because the competition for places is getting better and better. Rovers’ 2-0 victory kept them five points clear of seventh-placed Peterborough United who won at Blackpool. "It's another good result,” said McCann, whose side travel to Sunderland on Good Friday.